Genesis embodies a smarter more progressive approach to luxury with innovation and styling seamlessly integrated into your life. The winner of the 2014 Technical Grammy Awards is also the sound system of choice in the 2017 Genesis. Genesis strives to create the finest automobiles and related products and services for connoisseurs around the globe. It’s no surprise then that Lexicon was chosen as the state-of-the-art audio partner for this premium vehicle. Combining the Genesis vehicle design and engineering with the unparalleled sonic excellence of Lexicon is the new standard. Genesis embodies a smarter, more progressive approach to luxury with innovation and styling seamlessly integrated into your life. This next-generation premium sedan features Lexicon’s award-winning audio system engineered for pure musicality to the highest standard in acoustic realism. MIDRANGE One 100mm midrange speaker provides	essential fullness and balance to ensure rich, enveloping sound and a 25mm tweeter reproduces the highest frequencies of every track. MIDRANGE Four 80mm midrange speakers bridge the gap between bass and tweeter and provide essential fullness and balance to ensure rich, enveloping sound. MID-WOOFER Four 160mm mid-woofers handle a full range of sound and are optimized to send rich, clear bass notes to every seat in your vehicle. TWEETER Five compact 25mm tweeters can reproduce the highest frequencies so you fully experience the harmonics of every track. MIDRANGE Two 80mm midrange speakers bridge the gap between bass and tweeter and provide essential fullness and balance to ensure rich, enveloping sound. SUBWOOFER 250mm Dual Voice Coil Subwoofer delivers clear, low-frequency effects for any music genre, with sound you can feel as well as hear. AMPLIFIER 12-channel, 900-Watt amplifier uses Digital Signal Processing (DSP) to balance and enhance tonal blending, regardless of music or broadcast source. 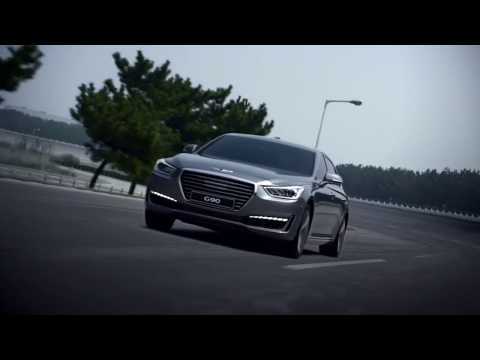 Through heart-stopping design and performance rivaled only by its first-class experience, Genesis is evolving luxury. With seamless innovation and style, Genesis offers the Lexicon premium audio system surrounding you in a customized theater of sound with unprecedented tonal accuracy. MIDRANGE One 100mm midrange speaker provides essential fullness and balance to ensure rich, enveloping sound and a 25mm tweeter reproduces the highest frequencies of every track. Lexicon’s passion for audio is on the same level as your passion for driving. Distinguish yourself with 17 high-performance speakers and 900 watts of power delivering 3-dimensional dynamic audio. Feel like you are in the audience at a concert or hear isolated audio elements like you are right on stage. With Lexicon, you hear the results of decades’ worth of technological experience, research and artistic passion. At Lexicon, we strongly believe in first-class quality music reproduction. Music must always preserve the character and nature of its origin. Music is meant to create a full and rich emotional experience. That attitude determines how we see and use technology. For Lexicon, technology has one purpose and one purpose only – to serve the music! Hear your favorite artists in a multi-dimensional surround sound experience where the boundaries of your vehicle seemingly disappear. QuantumLogic Surround Sound technology identifies and re-authors individual voices and instruments into a precise multi-channel soundstage, resulting in a crisp, authentic listening experience. Clari-Fi signal enhancement technology restores the true sound of all-types of compressed audio files. In real time, Clari-Fi identifies and rebuilds lost details so you hear music that is more faithful to the original recording. Lexicon high-performance amplifiers, with award-winning digital signal processing (DSP), deliver a premium audio experience to every seat in your vehicle.